mommygorjess: Books I LOVED in 2018! Books I LOVED in 2018! This year I want to write more about things I love. 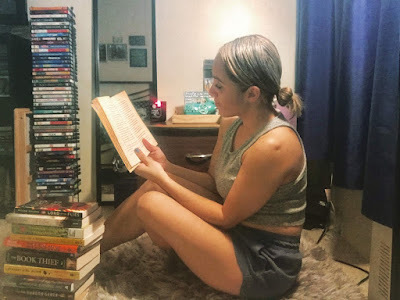 So I think its safe to say that if you know anything at all about me you know I am absolutely obsessed with reading and with collecting books. All my life it has been something I have been extremely passionate about. I believe it is honestly the most amazing gift I could ever get from anyone, and that is the reason why I have so many books just on my shelf that have yet to be read. So many books, and so little time. Yet I still find myself going up and down the Barnes and Noble aisles, grabbing up books I do not know when I will even get the chance to read. Its a habit I really can't stop, and wont ever apologize for. Everything about literature makes me happy, so whatever makes you happy I always feel you should keep in your life no matter what. Many consider me a book hoarder, but my life wouldn't be the same without all my book stacks around my room. They bring character to my room, and I wouldn't want it any other way. I will be the lady who lives in her books, and I am so content with that. I am a mom though, a working mom at that, that just started school again .... so my time is super limited. I read to and from work, and when I cant get shut eye thanks to insomnia I crack open a book again, but thats kind of rare. I try my best to get at least 20 minutes of reading in every day but it does not always go as planned when the boys decide that its a great day to be on their very worst behavior. I had a goal to read 12 books in the year of 2018, one book for every month, and I am so sad to say that I didn't even make it close to that goal. I read only 6 books all year! SIX! I am legit disappointed in myself, and I have decided that for 2019 I am going to work harder to reach that 12 book goal again. Let's hope this works this time around. But -- luckily for you I did read, and I would like to share with you guys my top four favorite reads for 2018. The ones that gave me that book hangover feeling, that character attachments situation, and just all in all gave me the feels for real. I will list them below and give you my reason for why I chose it as a favorite. Hope all my book lovers will enjoy this! They are all my favorite reads for ALL different reasons. Lets start off with Room. I got very invested in these characters, the mom, the little boy. I felt for them, and my heart ached reading about it. But the thrill of knowing what would happen next was great. I was just rooting for them the whole way through the book and when you truly care for your characters in a book I believe that's a true sign that you are going to love the book. Finding One is more of a self help kind of book and I have plenty of those - not because I have confidence issues or whatever but because I believe everyone in the world no matter how "perfect" your life is going always needs some kind of pick me up. A book that will tell them all these great things and help them manifest through these personal yet inspirational lines. Personal growth is an amazing thing to acknowledge and I really believe this is the best book for just that. It is also such an easy read, no big words, no weird messages, simple and straight up and I literally read it in one day. Highlighted it like there was no tomorrow! Gone Girl -- now Im sure by now you have seen the movie, and when I was reading the book I didn't even know there was a movie in the works! This book is just a book you can't put down, like the kind of book that you WANT to stay up past your bedtime because it leaves you hanging every minute, and you just can't seem to figure out what is really going to happen next. Its intense - NOT a feel good book with a happy ending....so if that bothers you I don't suggest but that is exactly why I loved it so much. It was raw, and a bit violent, just down right gritty. Let me tell you though - before this book I was not a fan of thriller books, I had no taste for them, but this one changed my mind about the genre all together, and it is all I have been able to buy since. So thank you Gillian Flynn because she really opened my eyes to genre I believed I disliked without giving it a real shot! Lastly, we have In The Country We Love. I originally got this book because I was a OITNB fan, and I loved me some Maritza, of course. So I thought hey why not. Plus Diane Guerrero is just amazing in all ways possible. I love watching her interviews, and following her on social media outlets. So I had a feeling I would really enjoy her book. It was very interesting because it is one of the first books in a long time that I was able to really feel like the author was me, was talking about me, was feeling the same as me. My parents came to the US illegally, and fought for years to become citizens, and I am beyond blessed that we did not have to go through the crazy situation that Diane's family had to go through, and be divided. But there were many times when I was scared of that reality as a young child so I really felt it when she was explaining all the times before when she thought it might happen. I loved getting a feel of her life before she made it on Netflix. She was a young Latina girl out in the big city, going hard so that she could change her life around, and hopefully her family too! I loved everything about this book because it goes deep, and teaches you a lot that I did not know about immigration laws and rights. It was such a great read, and I really don't like celebrity memoirs but this one didn't even feel like I was reading a memoir of a celebrity, it felt like I was reading about a normal person, just like me and you and that is what made it so good! Doggy Cookies/ A Dogs Way Home! Family Paint Night/ A Dogs Way Home!